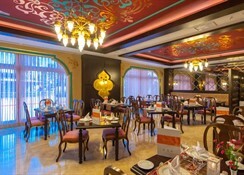 Renovated in 2010, this air-conditioned resort offers beautiful gardens and a total of 356 rooms spread over 5 floors, of which 40 are family rooms. 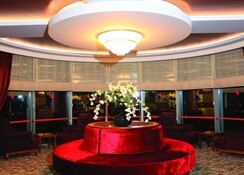 The impressive lobby offers guests a 24-hour reception desk, a currency exchange counter, a cloakroom and lift access. There is also a small patisserie, a reading room, a kiosk, a small supermarket, and various shops available. Further facilities onsite include a hairdressing salon, a bar, a pub, a disco-bar and a theatre auditorium. 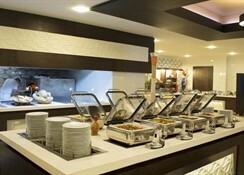 In addition there is a TV room, air-conditioned ï¿½ la carte restaurants, as well as a conference room. Internet, laundry and medical services are available for an extra charge. 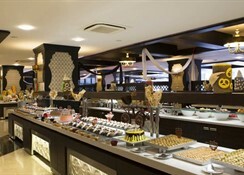 Younger guests between 4-12 years of age may participate in the kids club activities and use the children's playground. 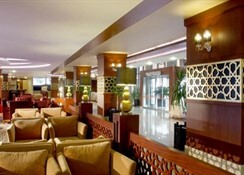 The hotel also has its own parking facilities and shares some facilities with it's sister hotel.